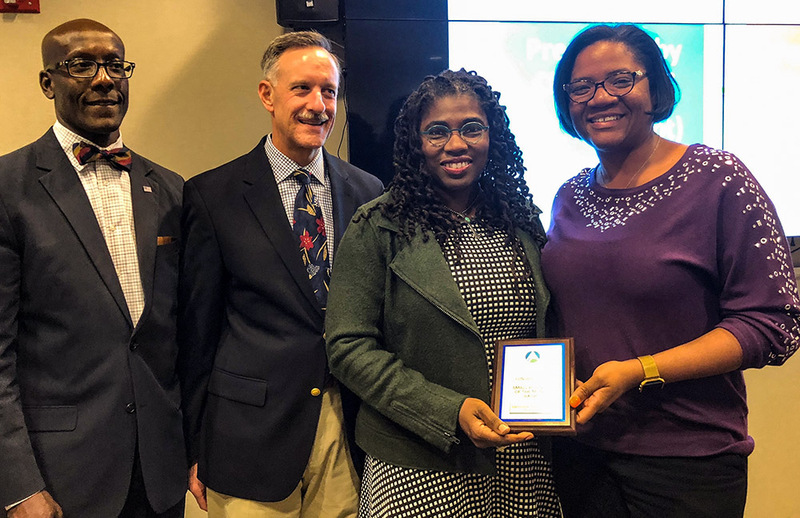 Aerotropolis Atlanta — Professional Human Resources consulting group AETC was recognized as the Aerotropolis small business of the month at the October Board meeting of the Aerotropolis Atlanta Alliance. After spending more than 10 years at Hartsfield-Jackson Atlanta International Airport as a Consulting Manager in operations and retail, Shawnalea Garvin founded the Airport Employment and Training Center (AETC) to serve not only the business owners at the airport, but also their potential employees. Staffing, customer service training and professional development was a long-standing need for Hartsfield-based restaurants and retailers, Garvin said. The Aerotropolis Atlanta Alliance, in partnership with the ATL Airport Chamber, selected AETC as its Small Business of the Month for October. The company also qualifies as a finalist for the Aerotropolis Atlanta Alliance’s Small Business of the Year Award, to be announced at the State of the Aerotropolis luncheon on Dec. 14. Cutline (from left to right) Artie Jones, III, Chairman Elect, ATL Airport Chamber; Dr. F. Stuart Gulley, Aerotropolis Alliance Board Chair; Shawnalea Garvin, founder and CEO, AETC; East Point Mayor Deana Holiday Ingraham.